Distracted driving isn’t just texting and driving. It is any activity that takes a person’s attention away from the primary task of driving. Some examples: eating or drinking, fixing hair or make-up, texting or e-mailing, reading (including maps), playing games, etc. 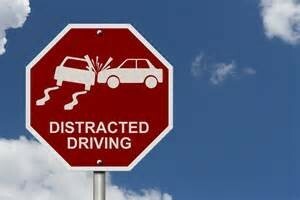 There are THREE main types of distraction: 1) Manual-taking your hands off the wheel 2) Visual- taking your eyes off the road 3) Cognitive-taking your mind off driving Please drive safely, 2 eyes on the road and 2 hands on the wheel. 80 citations were issued to drivers for lack of safety belt use, speeding, OWI, driving distracted, or other traffic and car safety violations. 110 warnings were issued to drivers for lack of safety belt use, speeding, traffic or car relation violations. To reduce injuries and enforce safe driving, law enforcement agencies will be on the road on April 13, 15, 19, 21, 25, and 27. La Crosse County participates in initiatives focused on reducing distracted driving as well as other risky driving behaviors. For more information, contact Maichor.